I opened Apple’s ios app yesterday for Apple Store and discovered that HomePod is finally available! Apparently Apple announced this 2 days ago, but since I’d not run across it anywhere I figured it’s still big news…right? 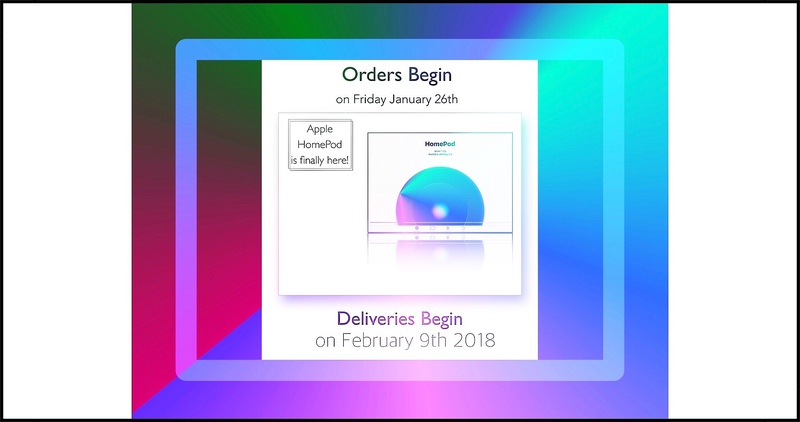 Just in case you’ve been living under a rock the last few months HomePod is Apple’s very late, highly anticipated entry into the home AI market. It’s a market that Amazon essentially owns right now with their extremely broad line of Echo devices. Echo’s biggest claim to fame is their popular AI assistant named Alexa. 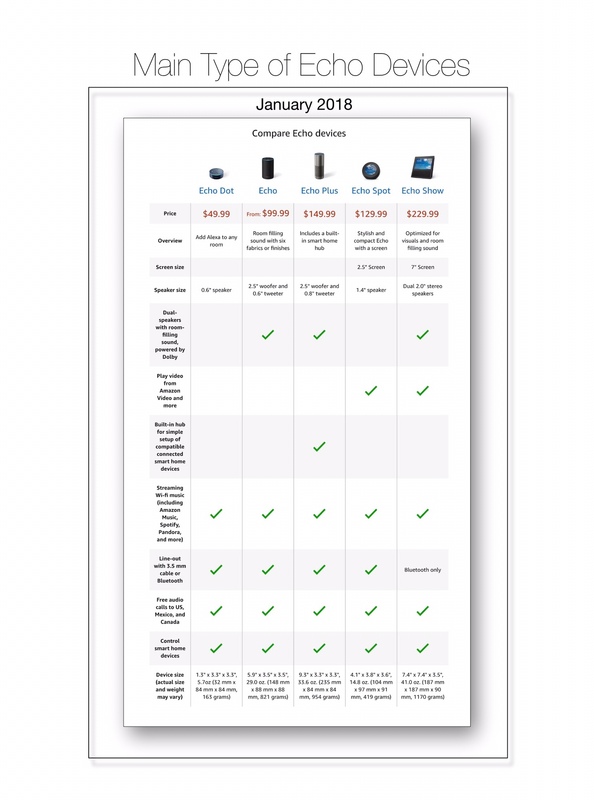 Below is a chart showing Amazon’s main product line of Echo devices…along with pricing. The reason pricing is important is because like all things Apple, HomePod costs more than the competition. But before I get into pricing, I should add that although the screenshot above makes it look like there are only 5 Echo devices on the market currently…that is far from the reality. Amazon just keeps cranking out more devices…and with each new introduction I think to myself…really…who would use that? Only to find myself actually considering buying it a few months later! No one Can Argue That Amazon Came Up With a Really Great Concept! 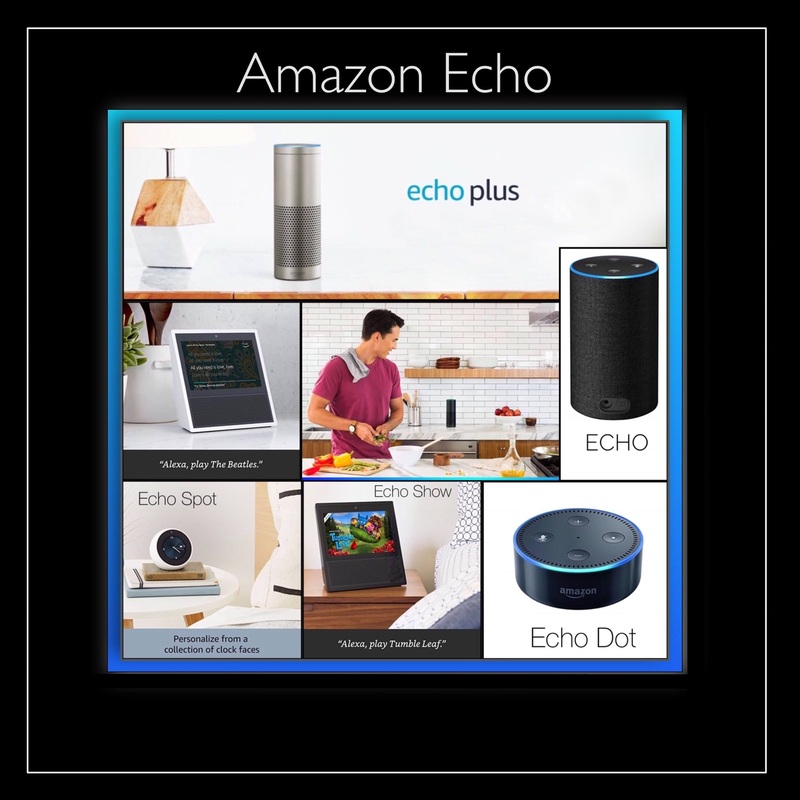 The first Echo device became available for purchase publicly in June 2015. For a long time…meaning over 2 years…Echo stood all alone in this market, which allowed Amazon to command a huge lead! Now other companies, recognizing they sort of missed the bandwagon are trying to play catchup. Google was the first with Google Home. Google Home came out in September 2017. Google Home was First Sold a Full 2 Years & 3 Months After Amazon’s Echo Was Launched! 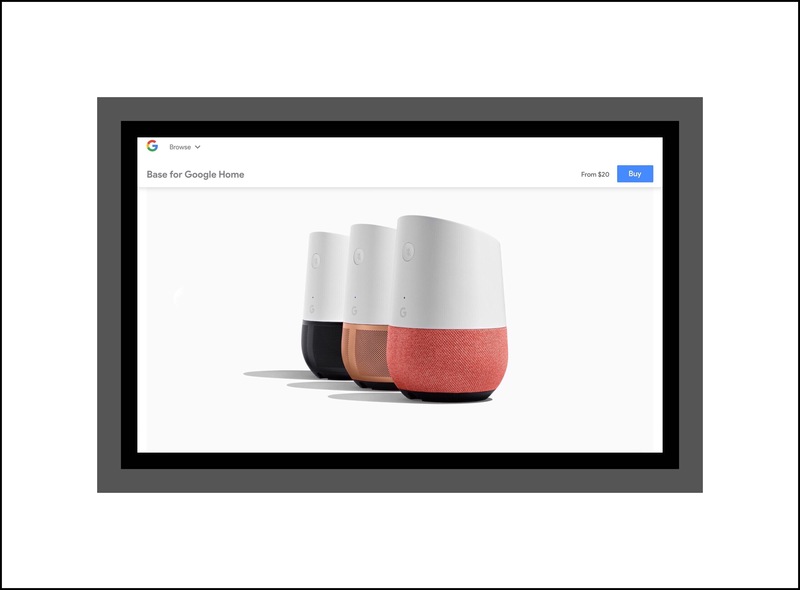 Even though such a huge amount of time had elapsed, when Google finally entered the market, with Google Home priced at $129, it placed Google Home squarely in the #2 position (mainly because no other competitors had entered the market.) At the time Echo was launched which was Amazon’s first and main Echo device, it was being sold for $179. This was despite earlier news reports saying it would retail for $199. But even that price didn’t last long! The original Echo’s price has jumped all around because that’s what Amazon does. You’d be hard pressed to come up with a ‘standard’ price for Echo. However, around the time that Google Home came out, Echo was priced at $129…which is why of course Google Home was also priced at $129. While both products were, and still are, very similar…many reviewers thought that Google Home is better at answering questions…and Echo is better at playing music and doing everything else. But that hasn’t been our experience. Ours has been very disappointing when it comes to true AI capabilities. In our experience neither has been great! We bought Google Home believing that since Google’s strength lie in finding answers online…so would Google Homes. But our Google Home routinely answers us with “Sorry, I can’t help with that yet” more often than not. Unfortunately historically Alexa is no better at answering our questions. ‘Her’ standard reply was always “I don’t have an opinion on that or I can’t help with that.” Although I just did try it again and Alexa has improved a lot in this regard. Now ‘her’ standard answer is “This might answer your question.” Then she goes on to provide some information which at least 50% of the time is really helpful! So in a side by side comparison right now, I would have to say that Alexa and Echo wins! Business Insider’s Ben Gilbert wrote a review of Google Home right after it came out. He was really excited to get it being a devoted Google fan. But his review was pretty awful. Google Home failed to do any of the things he needed it to do…things like connect to his Google Calendar for example…so ultimately he returned it. When Echo devices were first announced they were billed as smart speakers, but today they do so much more. While Samsung is rumored to be building a competing product using Bixby, their AI voice assistance utility, no one has any news on when that might be available or even if it is really happening. I was somewhat surprised to learn that Microsoft had released a competing product called Invoke last October, because I’d never heard anything about it. However, they did and reception was pretty good. 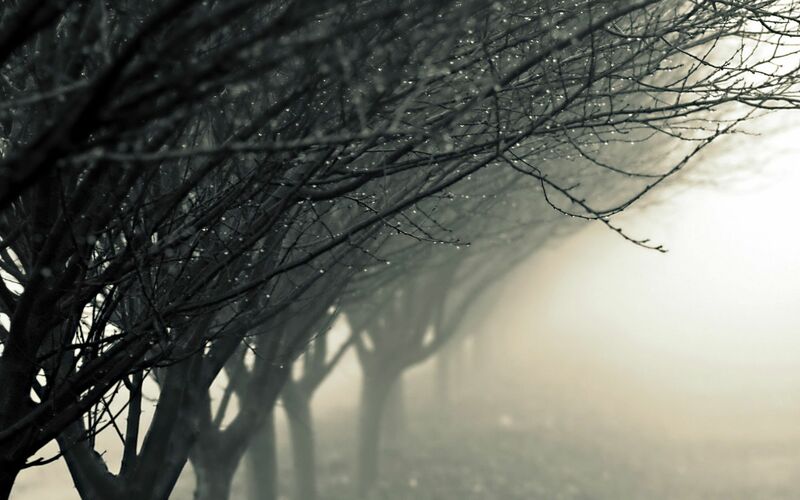 You can read about it in this Lifehacker article. 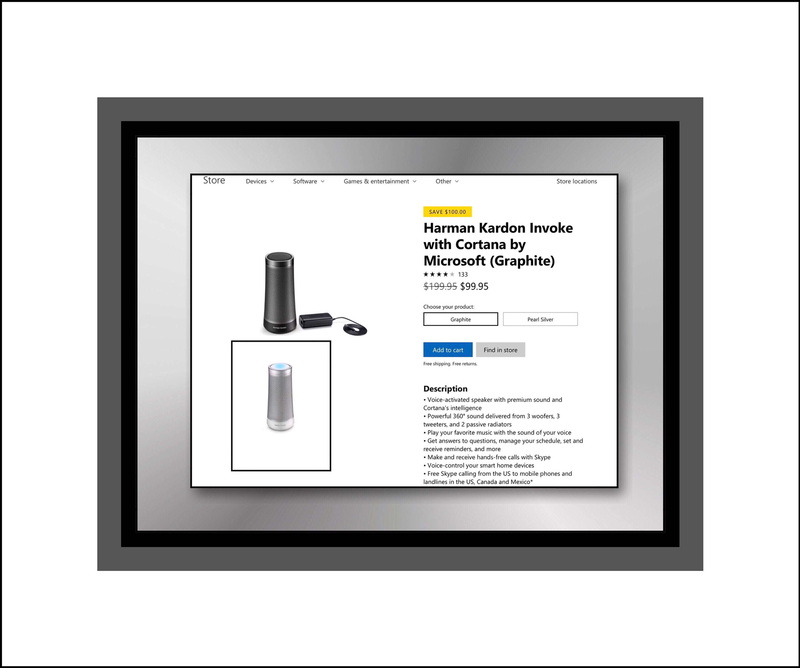 In checking out Microsoft Invoke for this post I discovered that Microsoft has recently decreased their price substantially by knocking $100 off of their $199 price tag. So, right now at least, you can pick up an Invoke for $99! While Amazon’s competitors have all been playing catchup, Amazon just keeps improving their main products with better, more robust features and with expanding the whole line of Alexa enabled devices too. 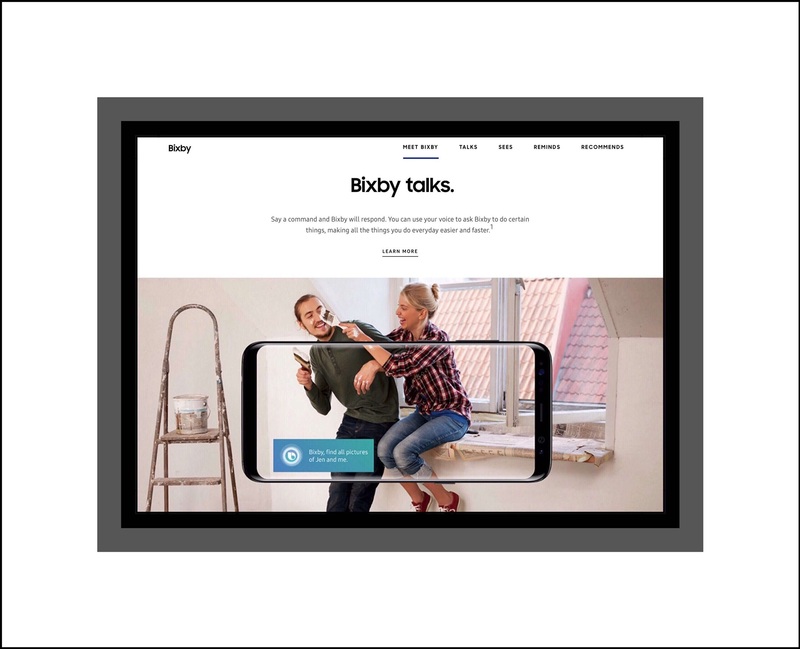 They currently have Echo Show and Echo Spot…which both have touch enabled screens for viewing content and their long-awaited Echo Look device. Echo Look has only been available to Prime members by invitation. This limited sales state has existed for almost 8 months now. It just so happens that we do have Amazon Prime and I really wanted Echo Look. I lobbied for an invite for some time and was finally successful! I have to say that I wasn’t disappointed…I’m thrilled with Echo Look. It’s a camera enabled device that helps me pack my clothing for trips as well as helps me shop when I bring home outfits that I try on in front of Look’s camera. It’s super easy to use and has already saved me a ton of time packing. Now it’s helping a lot in the shopping realm too! Not one to rest on their laurels, Amazon just keeps the new device launches coming. You can read about some of their newest devices in this Digital Trends article. The handwriting on the wall is very clear…Amazon is building an entire ecosystem around Alexa…and they’re doing it the right way! Each and every new device they release has experienced great reception by the public. Right now it’s anyone’s guess how Apple’s new HomePod will compete in this market. The Verge wrote an interesting article the day HomePod was announced for sale (two days ago.) In it they conclude that while Apple has a long way to go to catch up to Amazon and Google, and their features sound lackluster, Apple has this way of taking dire circumstances like this and turning them around. They point out that the iPod faced very similar circumstances when it entered the market…and we all know how that worked out! So, even though it doesn’t sound like HomePod will be much of a contender, don’t count them out just yet. 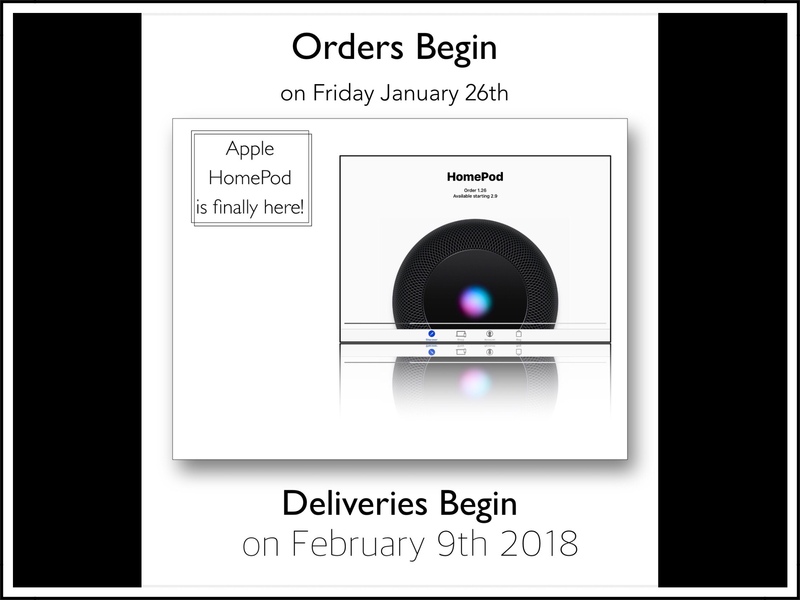 In just a few hours we’ll know for sure as the first users start reporting to the world how well HomePod really works. For its $349 price…it really needs to be amazing imo. Even Microsoft’s Invoke, billed as the most expensive smart speaker to date, at $199…was priced considerably less than HomePod at its introduction. 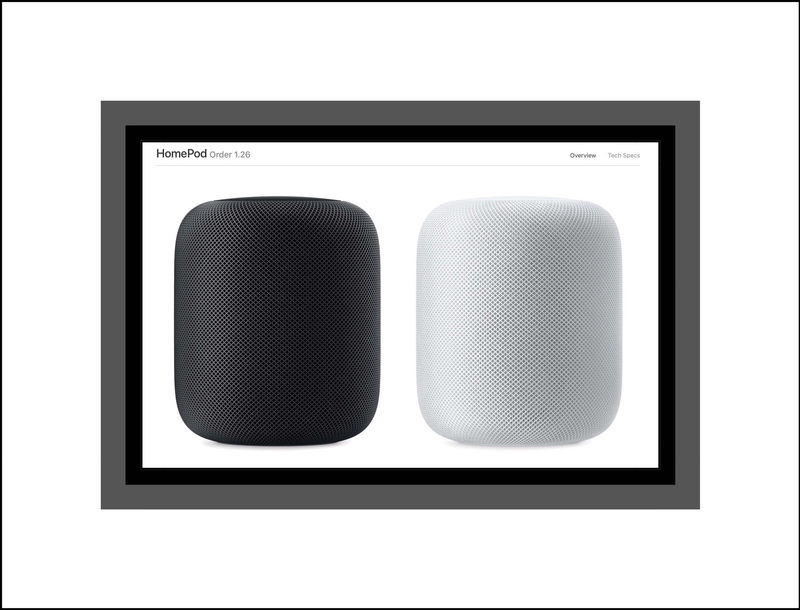 You can order HomePod using this link. 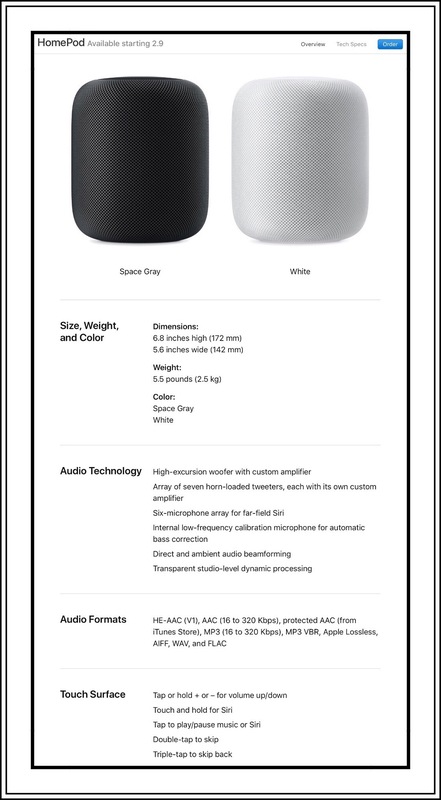 See Tech Specs for HomePod. Please leave comments by scrolling down past my bio.